A rounded shrub with grey-green foliage. 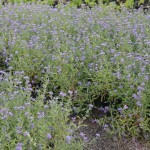 Blooms with fragrant, deep blue flowers from July through September. It has a tidy, upright habit. Prefers full sun and well-drained soil. It is drought tolerant. It can be pruned back quite hard in the spring to encourage fresh growth. Plant in a mixed shrub or perennial border.